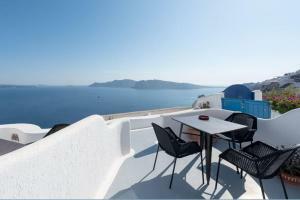 Well positioned in Oia, with a beautiful little patio. Lovely view over the bay, and not too ostentatious. Staff were very friendly and helpful. Pity we didn’t stay longer. 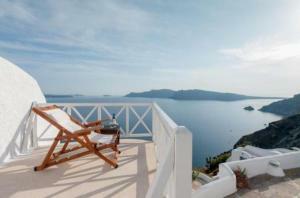 Great location, very helpful staff , close to the heart of Oia yet very quiet. didn't eat at hotel, but found great place just up road,hotel has a nice pool and bar area overlooking the caldera. lovely balcony area outside room for breakfast. bed good, great view, slower paced area in Oia. bus to port town, lots to do and eat, hot but windy. The staff is incredibly helpful. My wife and I faced problems trying to reach Santorini during the Cyclone and specially Valentino did his best to solve our problems including refunds and day tours already payed. 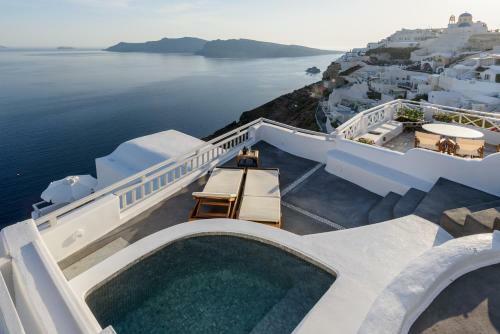 The hotel is perched on Oia cliffs and you won’t need any transport to reach the best of Santorini. Highly recommend!!! Location, view and especially the service were all great. And this is with pretty bad weather conditions. Very helpful staff. Although expensive the room was really nice (Oia is expensive compared to other parts of the island). We love the service from reception team, porter service, and cleaning team. They gave an amazing service. We love the pool. They recommend lots of restaurants which are amazing and help us to book. The view of caldera from our patio was magnificent. Having breakfast on our private patio every morning with this view was a great start of the day! The pool area is spacious and clean, having a swim and a drink there was a nice break. But, the best thing of all was the really exceptional staff. Evi, Valentine and Spiro made our stay at Strogili unforgettable. They were always ready to help, they gave us great tips, advices and suggestions what to do, where to eat and so on... fantastic people!!!!!! 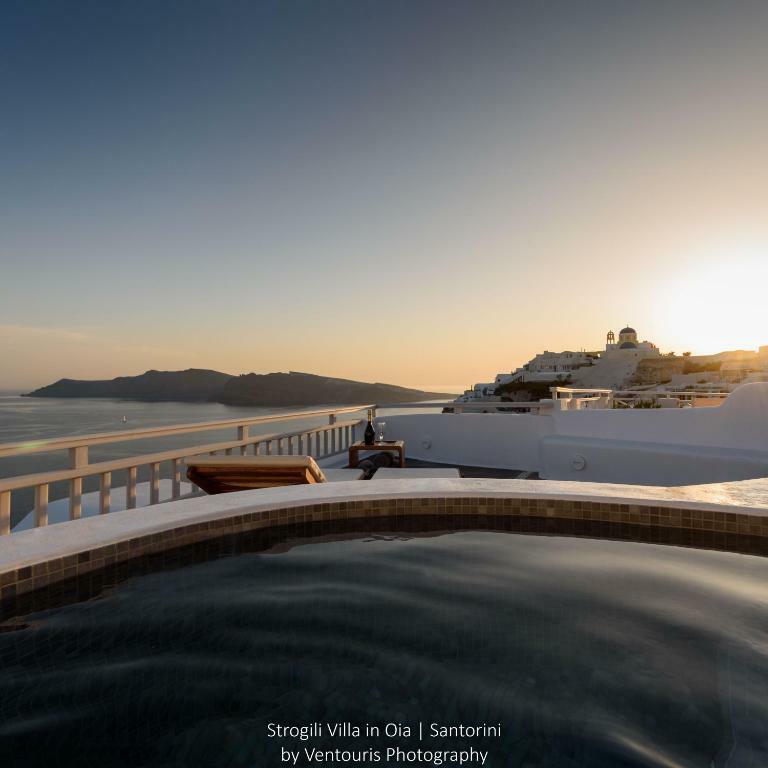 Lock in a great price for Strogili - rated 9 by recent guests. 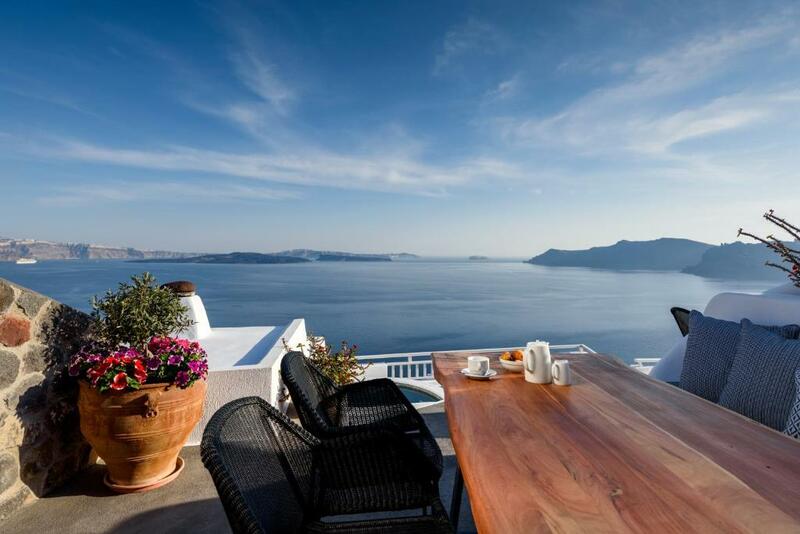 Enjoying spectacular views over the volcano and the Aegean Sea, Strogili offers traditional accommodation with charming furnished verandas, in Oia village. It includes a swimming pool with sun terrace and serves continental breakfast. The air-conditioned studios and apartments at Strogili are decorated with respect to the local style featuring built-in beds. They come with a living area and private bathroom. Facilities also include a satellite TV, toiletries and hairdryer. A welcome glass of wine is offered to each guest. The beach of Baxedes can be reached within 1.2 miles. Santorini Airport is 11.2 miles away, while Athinios Port is at 12.4 miles. The lively town of Fira is at 7.5 miles. Strogili guesthouse offers free Wi-Fi throughout and free private parking. Strogili has been welcoming Booking.com guests since 10 Feb 2012. 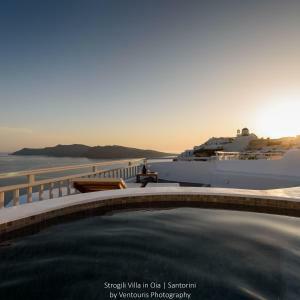 When would you like to stay at Strogili? Free! Free private parking is possible at a location nearby (reservation is not possible). Please note that style and decoration, as well as the location may vary. Please note that style and decoration vary. Breakfast is served in the apartment. Please note that style and decoration vary. Breakfast is served in the reception. This room was completely renovated in 2019. No extra person can be accommodated. Featuring Caldera views, this one-bedroom villa includes a balcony, air conditioning . This studio has air conditioning. Please note that this room is 70m far from the main building and is accessible only by stairs. House rules Strogili takes special requests - add in the next step! Children 7 and older are allowed at aparthotel. Strogili accepts these cards and reserves the right to temporarily hold an amount prior to arrival. Please note that laundry, ironing service and fax/photocopying are available upon charge. Kindly note that the reception operates daily from 8:00 until 21:00. Please note that some units are cave style, therefore they are only accessible by stairs. Please inform Strogili in advance of your expected arrival time. You can use the Special Requests box when booking, or contact the property directly with the contact details provided in your confirmation. Many cats wander the island and try to get into the apartments, can be annoying. 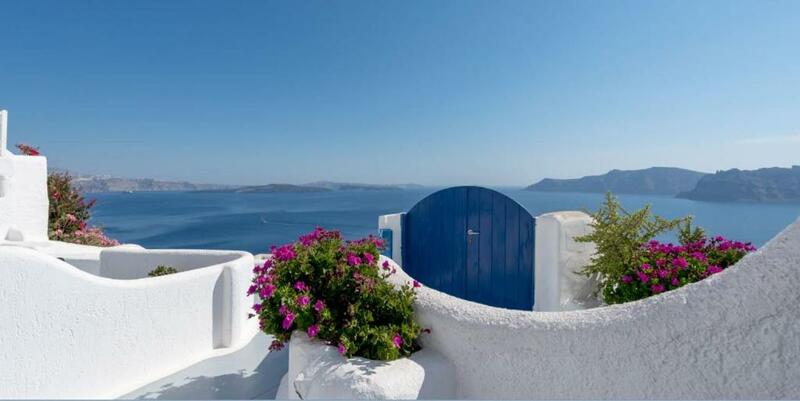 Good value property on the outskirts of Oia. Breakfast on the terrace is very scenic. Beautfiul property in the best location in Oias! The address was not accurate and google map took you somewhere else. The beddings in this hotel need improvement for the price. The view was lovely, the location is good and it was very clean. It also had AC in the room which was a plus. The breakfast was very nice as well. Our room was very cozy and clean! We loved the room being 2 floors where the 1st floor is our bedroom. It’s like our own little house. Location was perfect. Away from the busy area of Oia. Staff were very friendly and approachable too. They gave us mrestaurant recommendation which was very helpful. Would definitely come back! 1) Insect on dirty blanket which hasn't been washed for some time. Ended up with bites all over and itchiness for days 2) We are a group of 7 people, and have booked 2 rooms, entitle to 2 transfers each way. However Evi of reservation is asking for another 50 euros on our departure, the 6 of us needing a much bigger vehicle hence doubling the cost. We ended up in a cramped small van, with driver's friend also joining the tiny vehicle. Will that be the vehicle doubling the transfer cost? The location and views are to die for! our room was super small with a loft style 2nd floor above, nice but dated. just watch the restaurants pricing paid way too much for not much at the old port(recommended by hotel)? ?$100 euro for 1 fish fries and boiled greens, just as well the wine is sold by the litre, still had good time. Shouting/Angry faced breakfast staff, complaining we cannot start breakfast until 8 though the reception (valentine) booked us at 0745 due to our morning flight! Room was clean on arrival, but quality of daily cleaning was average and they didn’t provide extra soaps. Breakfast was just okay. Pool area was very nice with great views. Rooms were cute and charming with a nice patio area. Breakfast was just okay. We had it once and that was enough. Great location away from the fray and tourism craziness. Staff were exceptionallly helpful. Fantastic views from our room. Room was quiet and comfortable. Would stay again.